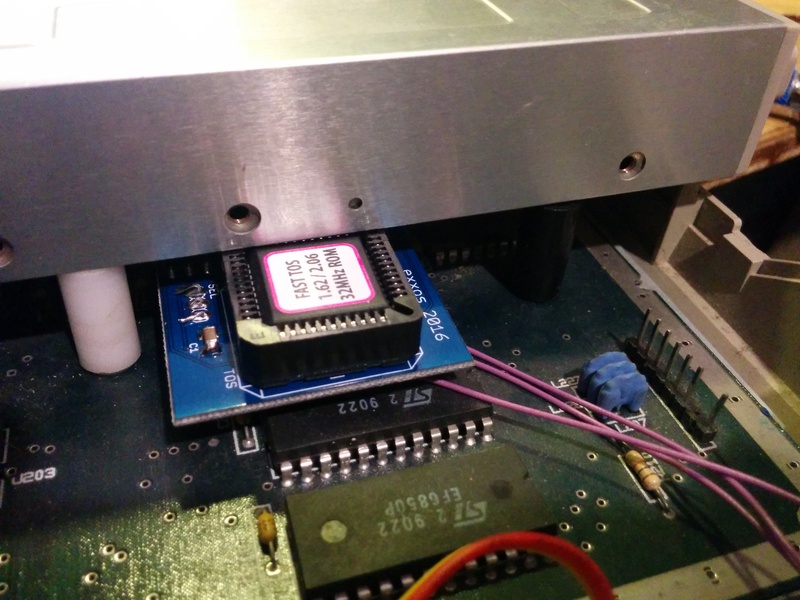 TOS 1.62 / 2.06 is selectable by a jumper on the board, or can be fitted with a toggle switch if required. This board can also be used as a "Fast TOS" upgrade with the V1 STE BOOSTER. When using any of my STE boosters with this particular series of dualtos boards ( be it the blue or black series) a 33R resistor should be placed series with the jumper wire between the DUALTOS board and the booster (CE line). This will help with some odd stability issues I have seen on a couple of motherboards. Just getting around to finishing / fitting the dual tos board but my "jumpers" are configured differently... The board came with tos 1.6 in 32-pin ceramic eeproms (pretty sure I can feel a 'window' under the sticker. Both W104 and W102 have a 0ohm resistor linking pins 1 to 2. W103 appears to be linked from pin 2 to 3 on the pcb. Do I need to do anything before fitting the switching board? Another question: about clearance... basically there is none and I expect the floppy drive not to fit. Some of this (~1mm) is down to my inexperienced assembly - I can see some of the pins could be soldered slightly closer to the board - but the rom socket feels quite high generally. I can't see it would ever fit... is there something I have done wrong? The links are as in this image.. If the board is assembled and pushed in correctly it does all fit.. Though I don't recommend leaving it in sockets anyway. I've braved removing the link resistors and replace with jumpers (my first mobo work and amazed I didn't fry the board... one of those links just didn't want to be removed). Regarding the clearance, how close should the kit be to the sockets, as I can't get it flush (I considered trimming the pins) and things only go back together with some mechanical assistance... screwing the floppy disk in place has moved the board slightly. Is this normal? I might end up taking your advice and solder into the mobo but will need to invest in a better desoldering solution to remove the sockets but don't have time to do that right now anyway. The board does need a good shove to insert fully into the MB sockets.. The PLCC socket should be level under the floppy drive normally as shown in the image. It shouldn't move when the floppy drive is in place. I like to do the jumpers too, will do the same to my other STE next time it's in bits.